This beautiful hand puppet measures about 14 inches tall (from head to toe). 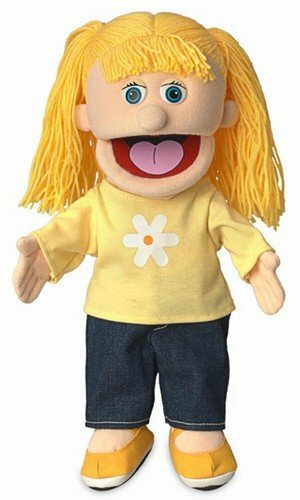 Puppets like this are not only fun- they’re educational as well. Let your child’s imagination soar with this great, creative, pretend play toy! Mouths and hands are very easy to move. Simply insert your hand up the bottom of the puppet. Your pinky and thumb can be inserted into the slots on the inside of the body to operate the hands. It can be tricky at first to get everything moving at once, but the main thing is moving the mouth- which is very simple. 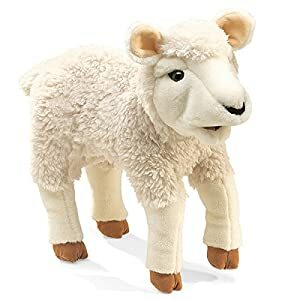 These puppets aren’t recommended for large stage shows, but make very nice toy and budget puppets. Their high quality and attention to detail make them a very special gift. Height is about 14 inches tall. Lightweight at only 8 ounces. Beautifully made and detailed clothes are removable. Be the first to review “14″ Katie, Peach Girl, Hand Puppet” Click here to cancel reply.